OK, we’ll leave the Victorian imagery there because we’re going to be writing programs in a moment and that’ll be silly. It’s a reasonable challenge, however; just how many ways are there of climbing a set of 17 steps, taking any combination of one and two steps at a time? Watson’s probably right; it’s a fair few. Well, we could try to solve this problem for 17 steps but a single solution to a single problem never really gets mathematicians and the like very excited. They would be more interested in finding a general solution to a general problem; in this case, that means for any number of steps. So we give the number of steps a convenient label (‘n‘, being as good as any) and ask the general question, ‘How many ways are there of climbing n steps, taking 1 or 2 steps at a time?’. So in ‘A Scandal in Bohemia‘, for example, n = 17; in ‘The Thirty-Nine Steps‘ (John Buchan, 1915), n = 39. In fact, we may as well put a label on the answer as well; let’s suppose that f(n) is the number of ways of taking n steps, taking 1 or 2 steps at a time. We’ve a nicely defined problem: given n, find f(n); for example, given 17, find f(17) or given 39, find f(39). f is a function of n, hence the choice of f as a label. In fact, let’s not mess about; we can start writing a program for this. The following code fragment is the main function written in C# in Visual Studio. It reads in the required value of n (the number of steps) and outputs f(n) (the number of different ways). There are various possible ways of approaching problems like this and experience improves the eye for ‘spotting’ the best course. However, a common strategy is to break the problem down somehow in the hope that a useful pattern or structure will reveal itself. In the case of the n steps, it might be worth considering what happens on the first stride; this will be 1 or 2 steps of course. If the first stride is a single step, this leaves n-1 steps yet to take (still in any pattern of 1 and 2 steps we choose). How many ways are there of taking these n-1 steps? Well, using our own definition, f(n-1) ways. On the other hand, if the first stride is a double step, this leaves n-2 steps yet to take and there are f(n-2) ways of doing this. At first sight, this doesn’t appear to have helped much but in fact it has … a bit. If n = 17, for example, it tells us that f(17) = f(16) + f(15). Is that no use because we don’t know what f(16) and f(15) are? Ah, but it also tells us that f(16) = f(15) + f(14) and f(15) = f(14) + f(13); and, in turn, f(14) = f(13) + f(12) and f(13) = f(12) + f(11), and so on. Eventually, we’ll presumably get down to something like f(3) = f(2) + f(1). We can’t go any further but this is good because we should be able to work out what these answers are for these small values of n = 2 and n = 1. And we can: the number of ways of taking two steps is two (a double step or two single steps) and the number of ways of taking one step is one (a single step); so f(2) = 2 and f(1) = 1. Not knowing at the outset what f(6) is, we call the same function for f(5) and f(4), which in turn call the function for f(4) (again), f(3), f(3) (again) and f(2), and so on. 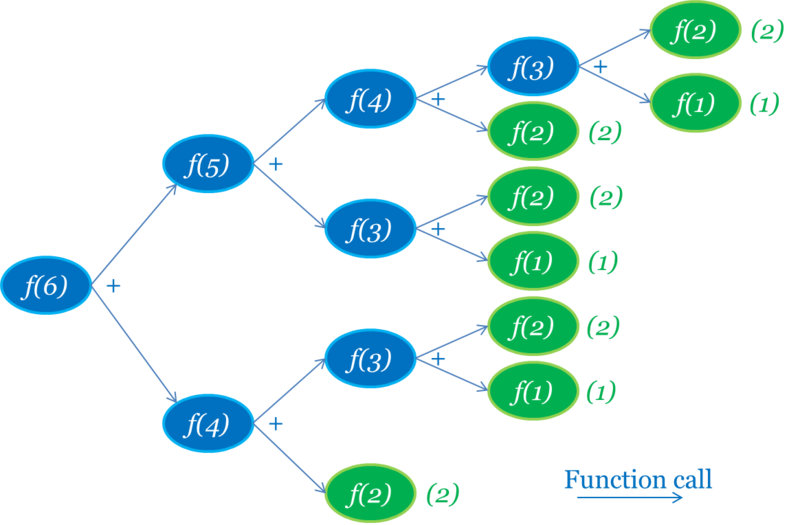 When we get down to values we know, f(2) = 2 and f(1) = 1, we pass and add the results back up the different branches to calculate f(3), f(4), f(5) and f(6). It’s just the one function but it gets used a lot; in each case, once from left to right when it calls itself with smaller values and again from right to left when it has the values it needs and passes its own result on. If we add the function code for f above the code for the main function, this should work. Run the program and we get a prompt for the value of n. Enter 17 and we should see the answer. Job done … Or is it? Just to make sure, run the program again with n = 39. Notice anything? Something of a delay? It’s going to depend a bit on your computer but try n = 40, n = 41, n = 42, etc. and see what happens. That’s not good, is it? Run this and you can see the attempt to calculate f(3), f(4), f(5), …, f(99), f(100), in turn. It starts to slow down (noticeably) in the forties. It won’t get there. (You’ll have to close the window to stop it.) What’s the problem? Well, look at how many times the function is called in the diagram above. Only a few times for f(6) maybe but now consider f(7). f(7) will use f(6) and f(5) so the diagram will be roughly twice as big (not exactly twice as big because the f(5) branch isn’t quite as big as the f(6) branch but close). This translates into time (and space but that’s another story) when we run the program. f(8) will be nearly twice as big, and slow, again. Each time we increase n by one, the time taken to calculate f(n) roughly doubles. If that doesn’t seem like a problem, here’s a nice story. So what have we got here; a problem that’s really difficult to solve or just a bad way of solving it? (This is an absolutely critical question in the wider study of computational complexity but we’ll just deal with the job in hand here.) Can we do any better? Is the whole f(n) = f(n-1) + f(n-2) idea flawed or are we just going about it wrong? Well, a little composed thought suggests that it’s actually the recursive solution that’s causing the problem. There’s nothing particularly wrong with the f(n) = f(n-1) + f(n-2) notion; the trick is to apply it the other way around. We start off knowing the values of f(1) = 1 and f(2) = 2 so what shall we do next? f(n) = f(n-1) + f(n-2) in this case looks like f(3) = f(2) + f(1) = 2 + 1 = 3. Now that we know f(2) and f(3), we can calculate f(4) = f(3) + f(2) and so on. Of course, when we look at it like this, f(1) = 1, f(2) = 2, f(3) = 3, f(4) = 5, f(5) = 8, f(6) = 13, f(7) = 21, …, it suddenly looks familiar; this is the Fibonacci Sequence. (You want maths in nature: look no further.) What’s more, this now seems like a blindingly obvious way to do it. The following code replaces the recursive definition of the function f with an iterative one. To be fair, this isn’t probably quite as elegant as the first attempt but try running it. That’s more like how we expect a computer to run, isn’t it? But it’s worth stopping to think about this. Both versions of the function f solve the same problem and neither look particularly nasty (in fact, if anything, the iterative version looks clumsier and a little longer than the recursive one). However, the difference in execution speed, their efficiency, is astonishing. One takes a fraction of a second; one will never realistically finish. Well, it’s at this point that the mathematicians and the programmers don’t quite see eye-to-eye. It may easy to write down expressions such as square roots and powers and they may look like single steps in an algorithm … but they’re not. There are loops of a sort in both when they’re implemented at the lowest level on the computer. Although powers can be calculated in a slightly more efficient manner than the way in which they’re naturally defined, there’s still a form of iteration in there. Roots are calculated by a process of successive approximation until the answer’s accurate enough. OK, there are some savings to be had: the root 5 could be calculated once and then stored, for example, but it still has to be calculated. The loops haven’t really gone anywhere – they’ve just hidden themselves. This final version of the function f is still pretty good but it certainly isn’t any better than the second version and is likely to be a bit worse in practice – not that we’d notice in this example. This entry was posted on Thursday, April 25th, 2013 at 8:25 pm	and tagged with Complexity, Exponential complexity, Fibonacci Sequence, Iteration, Program design, Recurrence relation, Recursion, Recursive definition, Software efficiency and posted in Academia, Algorithms, Computer Science, Computing, Mathematics, Programming, Software. You can follow any responses to this entry through the RSS 2.0 feed. « Dawn of the Intelligent Machines? I understand nothing about programing language. But I love the quotations you take from Sherlock Holmes. This in special I really like. Since I read it I never forgot and I think for everything you do in life, exercising the observation is something important, that everyone should try. I am trying it. While the Holmes quotes are a nice touch, and while the problem itself is a nice example, this exact distinction is brought up in the “Structure and Interpretation of Computer Programs” (SICP) chapter 1.2. Specifically the sections 1.2.2 (Tree Recursion) and 1.2.4 (Exponentiation). You may also wish to mention that the recurrence relation that you posted above uses (1 + sqrt(5))/2, which also happens to be the golden ratio, another interesting point. In any case, I would definitely recommend other readers to check out SICP by Abelson and Sussman, because it is an incredible book which covers these kinds of methods (and far more), and is probably the best place to start off computer science. The problem with using the Fibonacci Sequence as the opening example is that everyone knows how to generate that so recursion would seem an odd approach from the start. Using a different example to independently construct the recurrence relation combinatorically makes both the recursive and iterative approaches seem credible – the solved solution too, for that matter. This better makes the point that an apparently reasonable algorithm in theory might not be in practice. Sorry if this is already discussed in another post.